Eva Onalee Hoffman, age 103, of North Branch, passed away at home Saturday, August 4, 2018. Onalee was born on October 8, 1914 in Clifford to James and Mary (English) McInally. She grew up in North Branch and went to school there. In 1933 she graduated from North Branch High School. She was the oldest living graduate. On August 8, 1934, she married Floyd Albert Hoffman in Angola, Indiana. She would babysit many area children and took in laundry. She also worked as a house keeper at Lapeer Regional Hospital for over 20 years. Onalee also volunteered at Marlette Hospital for many years. Onalee attended North Branch Wesleyan Church and enjoyed reading Christian Books. 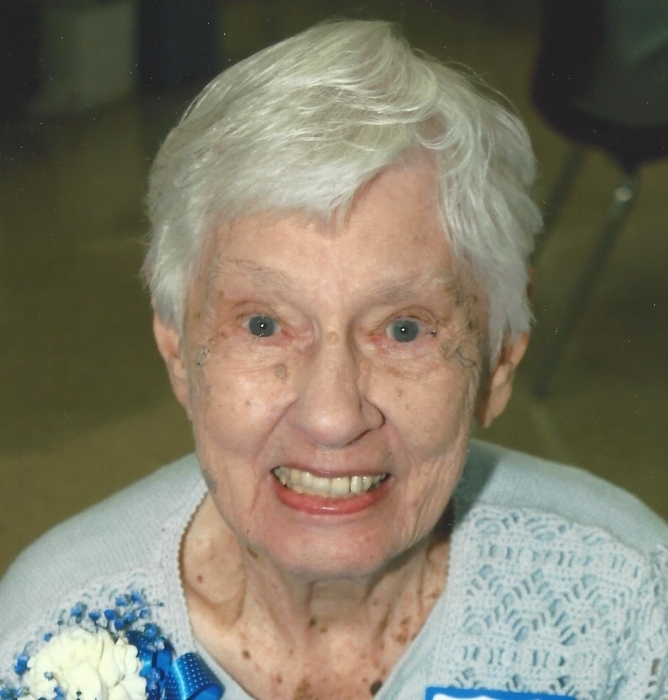 She liked doing crossword puzzles, word searches, watching and going to basketball and soccer games. She also enjoyed knitting, crocheting, sewing, walking, and working in her flower gardens. Most of all she loved traveling and spending time with her family. Onalee was survived by: her son, Gary (Christine) Hoffman of MA; their sons, Mark Hoffman of FL and Taylor Hoffman of MA; her daughter, De Ann (Fred) Lovasz of Columbiaville; their family: oldest child, Patti Butterfield, granddaughter Amanda Schlip and great granddaughter Hope Schlip all of Davison; second child, Pam (Robert) Stuewer of Metamora; their family: son, Nathan (Jaime) Stuewer and granddaughter Onalee Stuewer of SC; daughter, Rachel (Tyler) Leipprandt, grandchildren, Rhiana, Selah, Roman and Locklin Leipprandt all of Bad Axe; and daughter, Kara (Anthonio) Sanson of Attica; third child, Cheryl Lovasz of Columbiaville, her daughters, Alisha Lucik of CA and Kayla (Cody) Kipp and granddaughter Mila of Imlay City; fourth child; son, Stephen (Kelli) Lovasz of Fostoria; their family, daughters, Elizabeth Lovasz of Saginaw and Mariah Lovasz of Fostoria; fifth child, Christine (Rob) Lyman, her daughters, Allicyn Skinner and friend Joel and Aerial Skinner all of North Branch; her daughter, Bette Kay Swadling of North Branch; her family, oldest child, son, Chuck (Trina) Swadling of Grand Ledge, MI; their daughters, Samantha (Marcus) Schuette and granddaughter Skylar Schuette all of Lansing; Brittany (Stephan) Hogan and granddaughter Nova Hogan of DeWitt and their son, Jared Swadling of Grand Ledge; second child, son, Gary Swadling and grandchildren, Kenneth and Alyssa Swadling of CA; third child, daughter, Karista (Dustin) Jones and grandchildren, Eva and Lewis Jones of Columbiaville; and fourth child, son Andrew Swadling and friend Maria, grandson Andrew Swadling all of CA; the children of her son, Lynn Hoffman: his daughter, Amber (Nathan) Graham, grandson, Carter Graham of Canada, and his son, Micah (Anna) Hoffman, grandchildren, Rodney, Mila and Ronan Hoffman all of North Branch. She also has many nieces and nephews. Onalee had special friends, Joyce and Dan Rapphun. Onalee also had her favorite caretakers: Charlotte Peters, Audrey Denault, Sara Young and all of the McLaren Hospice helpers. Onalee’s family would like to thank all of their church families for all of the prayers. Onalee was preceded in death by: her parents; her husband, Albert; her son and daughter-in-law, Lynn and Yvonne Hoffman; grandsons, Rodney Hodges and Zachary Hoffman; great-grandson, Hunter Hodges; 6 brothers and 2 sisters. The family will be present for visitation on Saturday, August 11th from 12 pm – 2 pm, with the Funeral Service at 2 pm all at the North Branch Wesleyan Church. Pastor Peter Damaska will officiate. Onalee will be laid to rest next to her husband, Albert in Westlawn Cemetery in North Branch.